This 43ft Carolina Custom built by Island Boat Works with reliable Cummins diesel power fishes out of Los Sueños Marina in Playa Herradura. 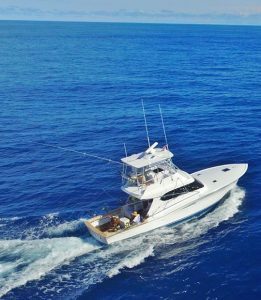 Captain Bubba Barter, the Billfish Foundation’s captain of the year in 2006, and on the list of Saltwater Sportsman magazine’s 50 of the world’s top saltwater charter captains, is at the helm. She is fully rigged with a full-size fighting chair, six strand harnesses, all electronics, an air conditioned salon, large cockpit and top-of-the-line tackle including a 17lb-weight fly rod; four 12lb rigs; six 30lb rigs; two 50lb rigs; and two 80lb rigs for any fishing situation that may arise while offshore or inshore.